well I want to start Baroque's inkcircles but I can't do so without fabric and stuff so I started another piece I've had for a while so that I get something else out of the way before I attempt it. So excited. 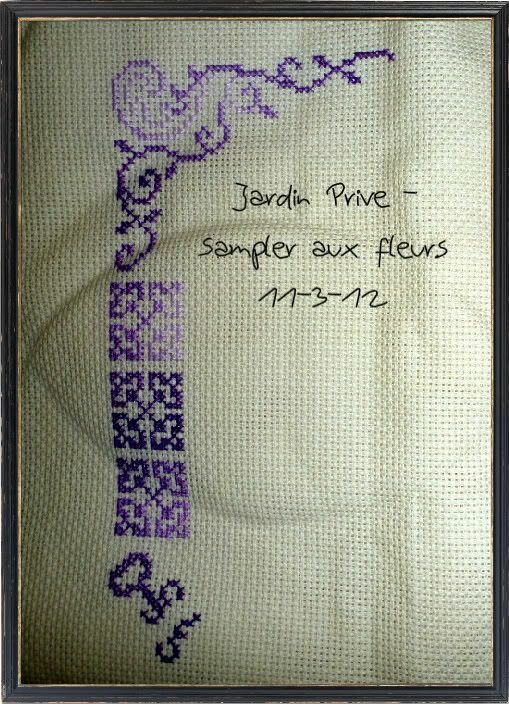 So I started Jardin Prive's Sampler aux fleurs. It's on 14ct Aida as that is the only fabric I have in my stash. It's fabric my grandma gave me from when she used to stitch a bit. It's a cream coloured aida which you can't tell by the photo. I am using DMC 52 a variegated purple which is much more red than this picture suggests. It wouldn't take a nice photo. This is my carry around project so that I can leave afternoon tea in one place as I really do need a craft light to see it properly without headaches. I love the way the purple is and I love the motifs on this design. It's a good warm up for baroque. I've done a little bit more over on the right. But we didn't get home until 8:30 last night so that kinda cuts into stitching time. Life has been crazy at the moment. My cold is still around but it's not giving me headaches anymore it's just messing with my voice. I don't know which is worse! I've managed to pull my back out and I know why. I don't do enough exercise and my back is yelling at me for it. But now it's hard to exercise when it hurts so much!I also need to watch how I move in classes and not be quite so violent in the movements. Great new start and afternoon tea is looking great! Your start on Sampler aux Fleurs is beautiful. I love the way you're handling the variegated thread! 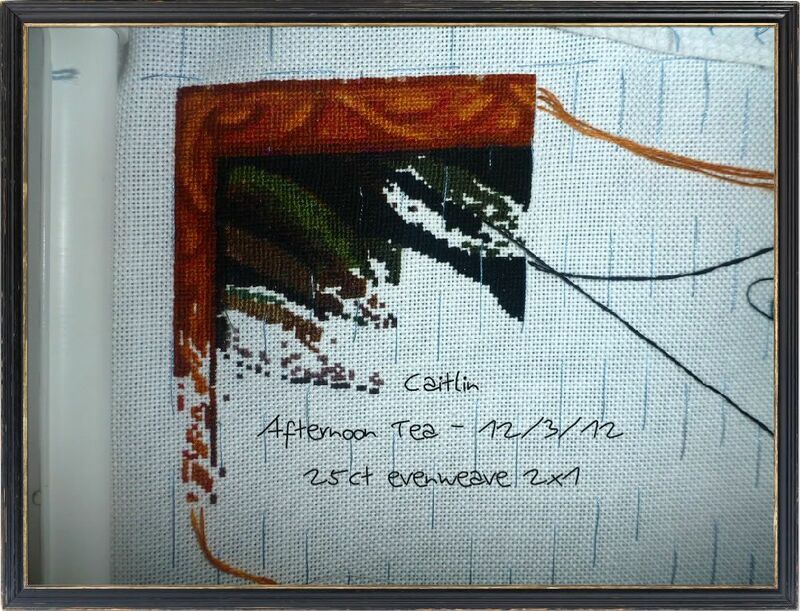 Oh, your sampler will look so beautiful with the variegated purple floss! The cream Aida is nice too. I just bought some yesterday at Michael's. Great new start Caitlan. I love the varigated purple floss. Beautiful new start!! Love the purple you are working with!! Great progress on your HAED too! Take care of yourself and rest up!! Oh your new start is too pretty. That purple you pick is just perfect for it. Beautiful purples on your new start! Afternoon Tea is looking great too! Glad to hear your cold is on the downslide, but sorry to hear you pulled your back out! :( Get well! Love your new start - I have that one in my stash too...and you are doing it in my FAVORITE floss color! Hope you feel better soon and should you take a long soak with some Epsom salt to help relax your back? 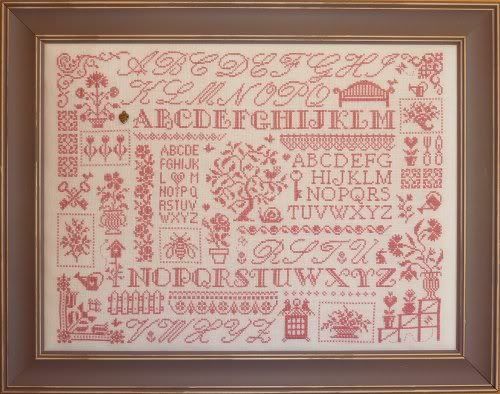 That's a lovely sampler and it looks like a fun stitch - a nice break from the solid blocks of color in HAEDs. Sorry to hear about your back. I agree with Joyce that long hot baths can help. Maybe a gentle backrub, too.